This tour departs from Cala Bona, Cala Millor, Sa Coma, S'illot, Cala Ferrera, CalaD'or and Cala Egos. You will need to hand over a printed copy of your when you are picked up. This tour departs from Cala Sant Vicente, Porto Pollensa, Alcudia and C'an Picafort. Visit Majorca's beautiful capital on this Palma Shopping Trip and enjoy a day to explore, shop and enjoy at your own pace. Round-trip bus transport is included from major resorts on the North and East of the island, so you don’t need to worry about battling traffic or finding your way there! 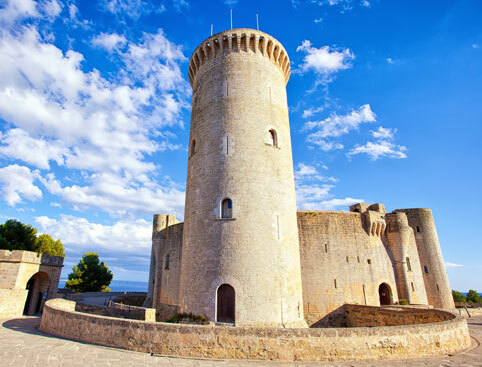 In the afternoon you’ll visit Bellver Castle, which has fabulous panoramic views of the whole city as well as the beautiful Bay of Palma.